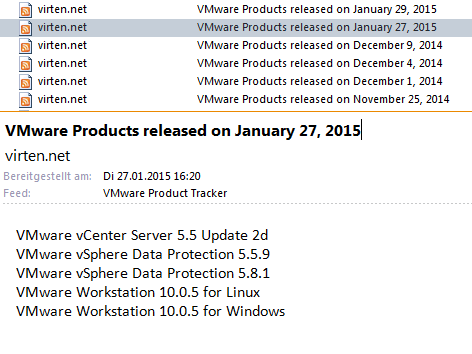 To stay up to date with VMware product releases you can use my vTracker since about one year. vTracker is a service provided by virten.net that notifies about new product versions using a website and a RSS Feed with daily updates. This week I noticed that an update from a SDK that I was waiting for was released 3 weeks ago. 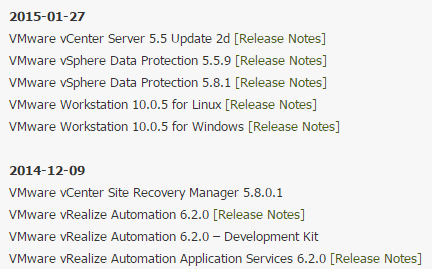 The main purpose of my vTracker was to get quickly notified about updates, and this should not be limited to products like ESXi or vCenter but also for Tools and SDKs like PowerCLI, Perl SDK, VMRC and VMware Tools (10). Indeed, your work is greatly appreciated!